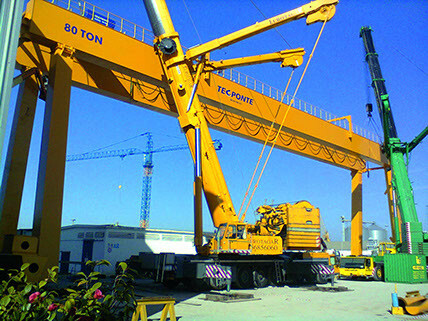 Founded at the beginning of the year 2000, Tecponte has large experience in lifting systems. Its entry into the national market and the rapid growth that followed allowed a cohesive position in the field in which it operates, with the support of a team of professionals with skills and knowledge in several areas. Its entry in the domestic market, coupled with the collaboration of a team of professionals with skills and knowledge in various areas, allowed its rapid growth, and a cohesive position on the market. For Tecponte each project is unique, being internally discussed and analyzed by our certified technics, in order to provide the most economical solution and profitable for the client. It offers a wide range of products in the field of lifting and moving materials, with capacities between 80 kg and 200 Ton. We ensure high quality in every operation inherent to the development of the product and an after-sales service based on a trust and scheduled service. Our technicians are trained to provide effective advice to the client as well as to establish a personalized and coherent follow-up.